Getting a pumpkin in the UK isn’t as easy as you might imagine. The only variety I saw in Tesco was of the carving variety, and I am guessing that not quite the same as baby bear, crown prince or delicata. More like pumpkin-grown-for-size-and-not-taste. The last thing I wanted to do was waste my one organic pumpkin. Over the past few weeks I have heard a lot about different pumpkin recipes like pumpkin brownies and pumpkin cupcakes. Roast the half pumpkin in an oven at 200oC for 30 minutes with a drizzle of olive oil, season well with salt and pepper. While the pumpkin cooks, add some cooking spray to a frying pan, and add the onion. Fry but do not brown the onion under a medium heat, once it’s beginning to soften add the rice and continue to cook for another 2 minutes. Add the stock in batches, of around 150ml, only adding more when the rice starts to dry out. Add the courgette, and continue to stir. When the pumpkin is ready take out of the oven, leave to cool for 5 minutes. Once cool enough to touch dice the pumpkin into medium sized pieces, making sure you remove the outer skin. Once you have added the last of the stock and the rice is starting to taste done (still has some bite but is cooked through) add the pumpkin to mixture. Heat through for 5 minutes on a low heat, ensuring it doesn’t stick. Serve with oodles of black pepper. I really liked this recipe but when I came across really large bits of pumpkin I found it a tad too sweet, so keep the dices small. I liked it particularly when the pumpkin had been broken down and just became part of the sauce. 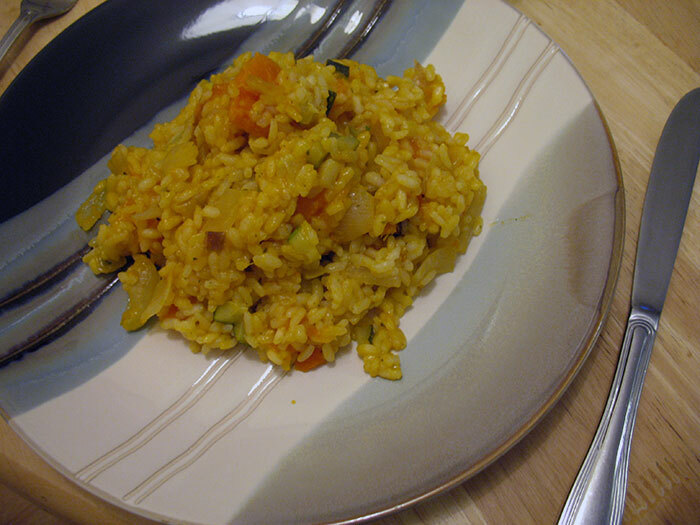 This was a great risotto, but something was definitely missing until I added lots of black pepper. Without it it’s a little bland.